Sunday 1st. Canada Day. Father Clovis’ eightieth birthday. Someone was walking around the entrance, they were parked, and walking around in little circles. I thought, maybe they don’t want to come in. Maybe they’re upset. But rather, they were musing on and looking at a new sinkhole in our driveway pavement. Monday 2nd. The front lawn this morning was displaying many, many buttercups. Brother Stephan today was on the new tractor, grading roads in the woods. These roads lead to fields, a big lake, and past two hermitages; also towards trails leading past a smaller lake, a gravel pit, provincial skidoo trails; even into backyards of town. Tuesday 3rd. Two couples from Quebec are here, just for the night. “Quebec”—west of here—means a more developed part of Canada, and remains an evocative idea for those of us who grew up here. Wednesday 4th. This morning, the eagle was not alone on his high branch. The crow seemed to want to take it for himself. But they flew around so elegantly, musically as it were, the issue calmly resolving, that it seemed they’re not simply fighting; they’re living something we don’t fully understand. Thursday 5th. Brother Stephan has been given charge of grounds and landscaping. Two significantly older gentlemen have taken to cycling here for Mass: you can see them heading into the sunlight, weekday mornings on the highway. Friday 6th. It was necessary to head to Trout Brook NB today to get a new garage door opener. Route 430 leads through woods and woods, then no town; there’d be mines, eventually, then a city, Bathurst. People living out there, visible outside the occasional home, seemed at once freed by the experience of such solitude in nature, and perhaps a bit burdened by it. Saturday 7th. The heat—exceptional July heat for here—has subsided. Brother Léo says the heat was a necessary spiritual purification for us. 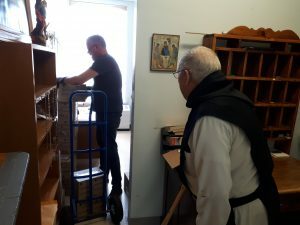 The radiator removed from Father Maurice’s former room found its way outside today—with a bit of convincing—and will be stored for sale as vintage home-building supplies. of ‘ping’. Often enough, guests’ voices blend in well with what the monks are trying to do. Monday 9th. Growth of brush along the banks of the lake was being trimmed back today. A tailor across the road is going to hem some robes for us. Some of the robes we got from England a few years back had yet to be done, depending on the monk. The seamstress’ Dad was our handyman many years back. She can remember her Dad sneaking Acadian poutine to one of the monks, who would eat four at a go, in hiding, then drink the poutine sauce. Tuesday 10th. In chapter, Steve pointed out that tomorrow is the one year anniversary of the repair shop fire; and someone suggested we have a barbecue outside to mark the moment. Dom Innocent is heading in to see Henry today. Wednesday 11th. A quieter day than last year, with a breeze pleasantly rustling the brush here and there. Last year, the wind during the fire was just the right strength and direction to wick flames from the shop, up, and away from causing more extensive damage. At lunch, we talked about changes in our families’ and friends’ lives, and began thinking about festive plans for Christmas 2018. Thursday 12th. 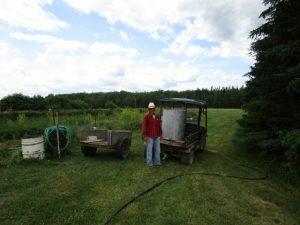 Brother Léo was impressed with the haying going on in a field next to the monastery, using equipment different from what we used to use. A few Parish Priests have been by on retreat. Both are very familiar with the place and us, and as you see them so still outside their usual activity, you realise what a remarkable life and spirit theirs is. Friday 13th. We received a thank-you card with Rupert Bear on the cover. Though nearly 100, he looks as fresh-eyed and sensitive as ever. In the scriptorium, there is now a Mass intention sheet for Priests to consult before celebrating. Saturday 14th. 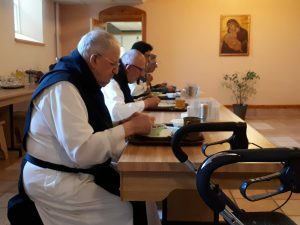 We have been praying for the Augustinian Sisters of Our Lady of Grace Monastery near Antigonish, Nova Scotia. Their monastery is being sold, they have been told they will have to leave thereafter. The site was originally Petit Clairvaux, where Trappists were present in the early 19th century. It is a beautifully-situated piece of land. Sunday 15th. This morning, it was grey and green outside. The reflection of the trees in the lake was more beautiful than the trees themselves. Among the insects appearing here and there in the monastery this time of year, there were tiny flies this morning around the light going into chapel. They’re so tiny you can sometimes breathe them in by accident. Monday 16th. An employee came by to introduce us to her two-week old child; we’re so happy for her; her Mom and Dad came with her. A monastery brings a quiet atmosphere; but a baby also brings, with everything else, a special type of peace. In Chapel, Brother Léo was helping the guests out with their Office books this afternoon, and occasionally looked out the window to see if the eagle was there, across the lake. Tuesday 17th. Father Bede says the lakeside trail is in fine condition for walking, presently. The trail is on the west bank of the lake; one of the monks’ hermitages is across the lake from it. Father Innocent says his garden is doing well. 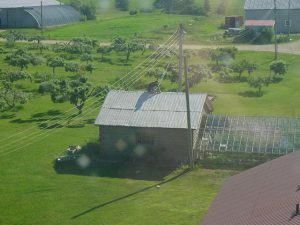 Some of our neighbours are having a bad year; some are getting a more successful garden by using soaker hoses. Wednesday 18th. We finally got actual rain, and the sound of it turned heads. But Brother Glic still has to do quite a bit of watering in the garden. Thursday 19th. The road to Moncton, and Brother Henry’s, passes by a nice marsh but today the marsh looked almost completely dry. At Champlain Place, Brother Henry enjoyed a cold smoothie in the food court, and took in the changing look and sound of today’s mall-goers. Our dumpster got a fresh coat of blue paint recently. Near it, weeds growing through cracks in the pavement show surprising vitality and greenness. Friday 20th. The raspberry canes have begun to yield their berries. Father Innocent has begun clearing out a room in the annex which had gradually become a storage room whose unusual mix of contents no one alive would be completely able to explain. The idea is to be able to store freshly-made coffins there, once there’s space. Saturday 21st. 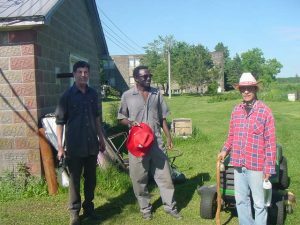 The walk-in freezer failed, so Father Roger and Brother Glic distributed its contents to various back-up freezers. And we wait for technicians in the new week. Sunday 22nd. A mist floated over the lake this morning. After Mass, old friends, themselves quite old, stopped outside to reconnect, and talked a long while before getting in their cars. 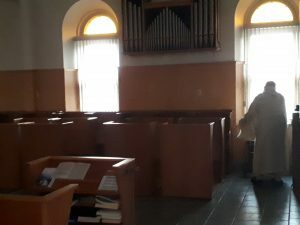 Brother Stephan practiced the organ in the Chapel for a bit after None, then it became quiet, the feeling of Sunday carrying through. Monday 23rd. The rain faded, having only begun, then the sky this afternoon was an unusual mixture of blues and greys and whites: in melody almost like a song. Tuesday 24th. Some of the daily Mass-goers are quite old, and quite strong. Today their faces showed some strain from the heat, and they seemed more beautiful than ever. Vulnerable. Free. Donald drove in with his delivery truck and brought a stack of votive candles to Brother Léo’s office/depot. 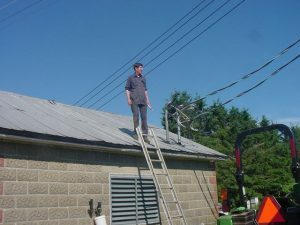 The technicians were in from the Miramichi to work on our walk-in freezer. Its temperature slowly dropped back to normal. However, this would not last the week, and the back-up freezers remained in service. Father Bede and Brother Steve made it in to see Brother Henry today, to his delight. At Vespers, a hymn returned we had not sung too much in a bit. For feasts of monk Saints, (today Charbel); it is an ode to the dramatic turns of spiritual life from the beginning, the call, to the end. Wednesday 25th. Today was the 20th anniversary of Father Innocent’s Priestly Ordination. For Priestly formation, his life was touched by, graced by, the Dominicans. Father Roger travelled west by car this morning, to Woodstock NB, on business. 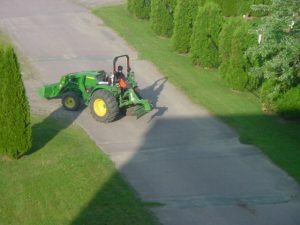 Brian spent a good part of the day spreading lime on the lawns. Thursday 26th. Brother Steve worked on the gate at the front entrance during the week. This morning, remarkable dark clouds promised rain. Then there was remarkable wind instead, and away the clouds went after just a touch of rain. The weather extremes make home look and feel a bit like some neutral place else. Friday 27th. In the hours before dawn, there were some fireflies brightening up the night. But then, as I walked outside near the monastery, there was a sudden growling from among the trees, as from a large animal. Was it Bigfoot? Too dark to say. Saturday 28th. Father Innocent took some time to show two young friends around the monastery, and to explain what the idea is. Their eyes were full of wonder at something, for them, completely new. Brother Leo explained to some nice folks from the north, we don’t have hay to sell anymore. Sunday 29th. At Sunday Mass, many showed up. But the heat seemed to have taken a bit of the ping out of their responses. Monday 30th. My younger brother made it up for a week’s retreat. Our parents will join us in a few days. For Mass this morning, Bede chose a Mass for the Church herself. 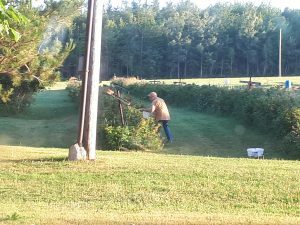 Father Clovis has returned from assisting at a successful novena celebration of Sainte-Anne-du-Bocage, on Caraquet Bay. 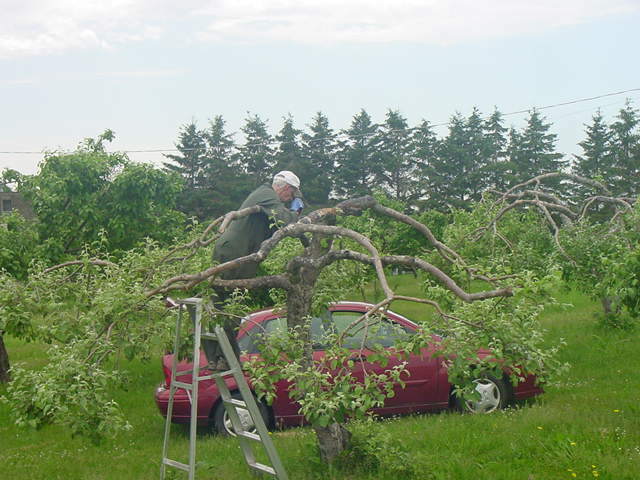 In Dieppe, at Brother Henry’s residence, a former farmer was talking to us about how good it is to get out of farming; and how much he loved it. He’d worked the land with horses, for 50 cents a day, as a young fellow. Tuesday 31st. As the sun rises, the wall of trees to the south (across the lake) or to the north (evergreens against part of the parking lot) evoke the thought of something unseen, even when one knows what’s behind them.